Almost certainly the most popular modifications for vehicles is the addition of alloy wheels as they are light and attractive and are the perfect choice if you want to improve the performance and look of your vehicle whilst retaining the safety. Whilst some cars have the option of coming out of the factory with alloys, it is possible to fit aftermarket alloys to almost any vehicle, and there is almost an endless choice of different designs you can buy. The main advantage of alloys is the weight. Alloy wheels are much lighter than standard steel wheels, which mean that the overall unsprung weight of the car is reduced. Reducing the weight of the car can mean that the car becomes more fuel efficient, which is great for taxi drivers like myself. It can also change the way that the car handles. If you get your alloys fitted by a professional, they will balance and test the wheels to make sure that the car will continue to handle perfectly. Alloy wheels also look much more attractive than standard steel wheels look, in my opinion. If you take pride in your vehicle, then alloys could be the perfect choice for you. Alloys can also be cast in a variety of different designs and styles, which means that you can also make some unique statements with your new wheels, so long as they meet British safety standards and legal requirements. The way that alloys conduct and dissipate heat also means that they offer better braking performance for drivers. 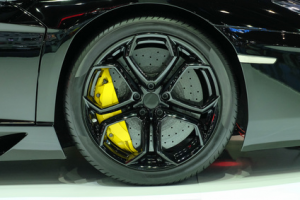 Because of their worth, alloy wheels are more likely to be a target for thieves. If you fail to protect your new wheels adequately, you may find that your wheels get stolen, and don’t think it won’t ever happen to you because it can as I’ve found out from personal experience. Because of the increased risk from thieves, and because of the additional cost of the wheels, you may also find that your insurance premiums are higher than they would be if you had standard wheels, so always check if this is the case. You should inform your insurance company if you do have alloys fitted. To reduce the risk of your allow wheels being stolen, make sure that you always park your car in a well-lit, open area or a secure garage if at all possible. Check up on the car regularly if you are not driving it every day. If you are getting your wheels fitted as an aftermarket modification, make sure that you get the garage to use special lug nuts which need a special key to undo them. This will make it harder for thieves to steal them. Special wheel cleaning products are available for alloy wheels. Always wait until the vehicle is cold before starting the cleaning process. Use a soft bristled tyre brush when cleaning your tyres, so that you do not risk scratching the alloys. Rinse and dry your alloys after washing them with any cleaning product, so that you do not end up with streaks and smears. If you are buying a completely new vehicle, you may have the option to choose alloy wheels. These are usually an optional extra, but can be chosen at the customisation stage. If you want to get wheels aftermarket, then there are plenty of national chains, such as Halfords which are able to sell alloys in standard designs and sizes. A full set will normally cost between £500 and £1000. You will also need to pay for installation. It is also possible to get alloy wheels from smaller, specialist manufacturers across the United Kingdom. This is a better choice if you want something which is a little bit different, of if you are looking for a wheel which is not a standard size. This is likely to be slightly more expensive.